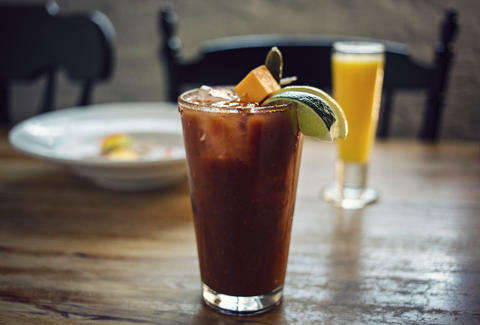 If you’re not a fan of Bloody Marys, chances are high that you haven’t had a good one -- for the record, your collegiate concoction of watered-down V8, well vodka, and a celery stick doesn’t count. Luckily, Bloody evangelists and converts alike can flock to the 11 best boozy tomato cocktails around Chicago. Yes, you’ve heard about the first-class burger and it lives up to the hype, but the signature Bloody Mary is a stunner by its own right. Piled high with homemade pickles, this marriage of V8, Tito’s, horseradish, and black pepper packs a sweetness that balances the spice. Pro tip: it gets seriously crowded here, so you may want to stake out the bar to get a front-row seat for Bloody Mary slinging and cheeseburger grilling. 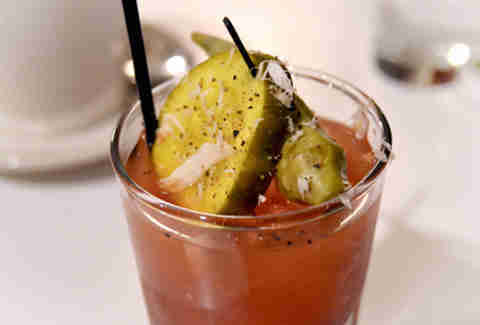 It’s no surprise this Big Easy-inspired Bloody would be big on flavor and spice. Lemon and Crystal hot sauce flavors take the stage, with house-made Worcestershire and fresh horseradish playing back up. The result? A simply fresh and spicy tomato flavor. If that’s not enough, the complimentary beignets will have you jonesing for another visit. 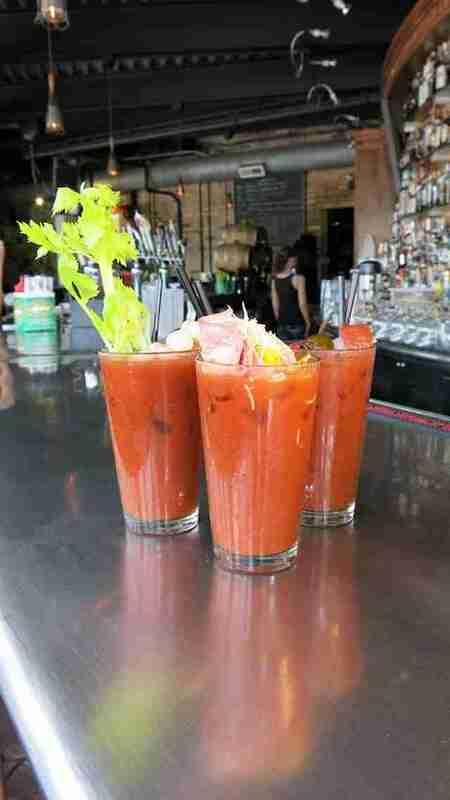 Saddle up for a Coyote Ugly-esque brunch vibe -- this BBQ joint offers the city’s best Bloody Mary bar, hands down. And thankfully, it gives directions along the way. Choose your rim, then your booze. If you’re bold, we recommend whiskey or tequila to complement the smoky BBQ spices of Bub’s house mix. Next, garnish like crazy with roasted peppers, shrimp, pimento cheese-stuffed olives, mini grilled cheeses, and more, and grab yerself a High Life pony. Giddy up. You gotta love a boozy tomato cocktail that’s delectable and distinctive without all the frills. 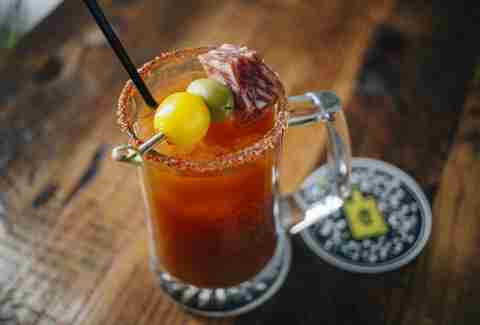 The Board & Beer Bloody Mary at this Longman & Eagle sister restaurant is understated and well balanced, yet big on horseradish and spicy flavor. And, for your friends who can’t handle the magic of a Bloody Mary, there’s an impressive beermosa cocktail menu. The Serious Bloody Mary at this Jewish deli-meets-diner is seriously delicious. Big on tomato taste, it’s tangy, spicy, peppery, and heavy on celery salt in a good way. They’ll ask to upgrade to premium vodka, but it’s thick enough that you don’t need it. Unless you’re fancy. 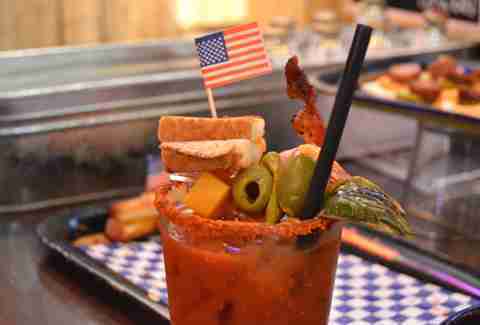 The garnishes aim to please with a celery stick, lemon, olives, salami, Swiss, and a cute Eleven City flag. If you love it, you can buy the mix for around $7 and DIY at home. Every once in a while, you find a brunch cocktail that truly marches to the beat of its own drum. 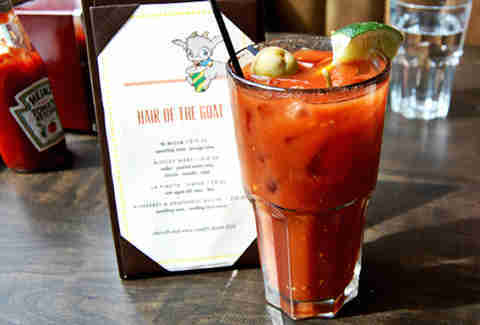 The Hair of the Goat Bloody Mary at this Stephanie Izard outpost is just that. It’s smoky, spicy, and full of pickled flavor, a mash-up of cultural tastes that just works: pickled onion juice, kimchi, masala, and miso. The generous size makes this Bloody a superb value. 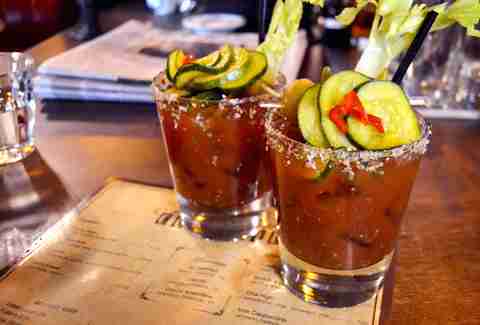 Ordering a Bloody Mary or Bloody Maria seems like a rookie move when you’re at a bar (and inn) that’s venerated for its whiskey selection. Order yours with whiskey and you’ve got yourself a Bloody Lawrence (known as Bloody Larry to his pals). Get ready for love at first sip. 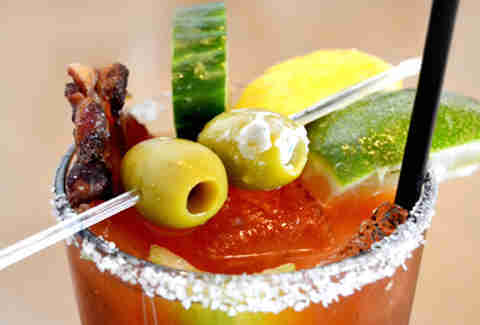 You’ll swoon over this Bloody Mary’s decidedly fresh and briny flavor, made more distinctive with a heavy dose of cumin. The garnishes are quite dreamy as well with crispy bacon, cucumber, a blue cheese-stuffed olive, a standard green olive, celery, lemon, and lime. We’d be soulmates if there had been TWO blue cheese-stuffed olives. You COULD do the Bloody Mary cart. But what’s the fun in that when you can wrestle 32oz of the Sumo Mary? 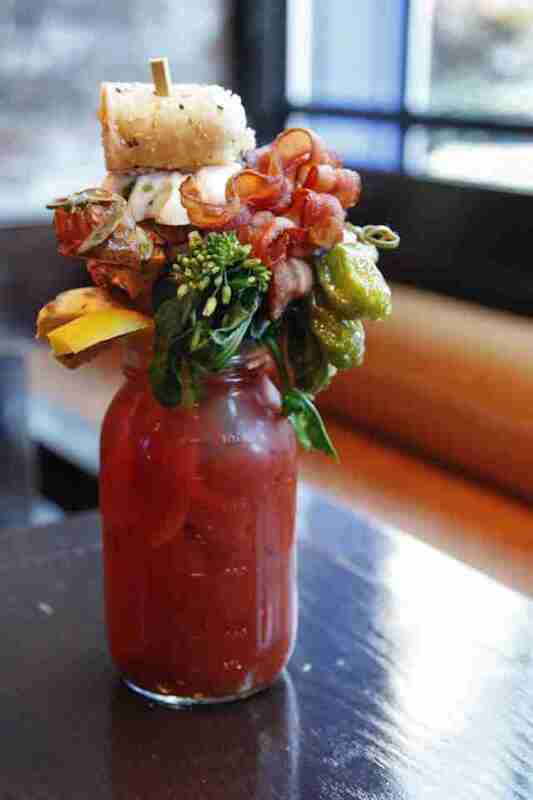 This beverage-and-meal-in-one is Chicago’s most ridiculous Bloody Mary because it’s ridiculously amazing. With a unique Asian flavor, its massive garnishes include a baked Alaska crab roll, a Chinese duck bao bun, pork belly, grilled cheese with tocino, oshinko, roasted potatoes, shishito peppers, lumpia, Chinese broccoli, and bacon. 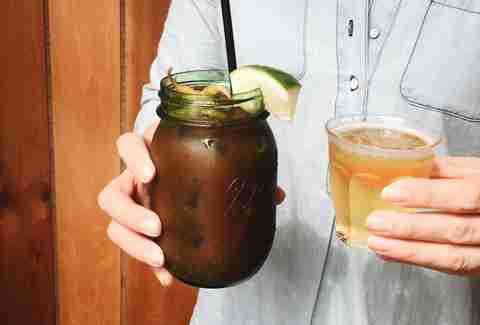 If it’s actually a nice summer day in Chicago, take advantage by setting up shop at this biker-ish joint’s rooftop patio and work your way down its legendary Bloody Mary menu. There are eight in total, ranging from the classic Road Rash, to the spicy Smokin’ Salma, to the smooth gin-cloaked Bloody Queen, to the smoky Scotch-filled Deliv’rance. 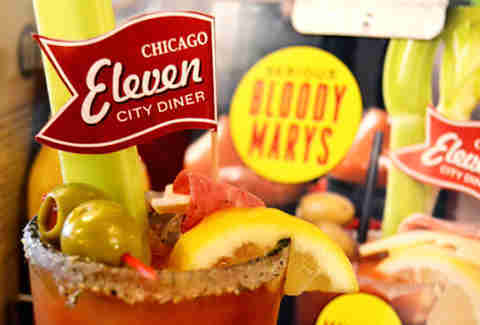 Follow Elaine and Amber on their quest to find the absolute best Bloody Mary in all of Chicago’s neighborhoods at BloodyBest.com.